Is it just me or is there a trend nowadays for men to grow beards as soon as their first child is born? It might even be more a rite of passage than a trend, one that could possibly be born from embracing this next chapter in a man’s life: the Dad stage. The one where you teach your child to fish, to trek through the woods and build a bivouac, to construct a fire by the embers of which they’ll later sleep soundly, while you, with your flannel shirt and impressive beard, smoke a pipe that you carved yourself and smile softly at the bond that has been forged thanks to your irrefutable rugged Dadness. Well, it’s either that or parenthood leaves men too damn tired to shave anymore. Where I live – the urban wilds of south east London – there are enough bearded dads to suggest they’re being churned out by some local cloning plant, but I’d wager none of them have ever carved their own pipe. I can picture them rushing, clean shaven, into labor wards with their pregnant wives and emerging a few days later, proudly cradling a newborn and a new beard. The bearded dad has two big new responsibilities in life: to care for his child and his beard. Whatever my experience with the former, I feel far more comfortable discussing the latter and even more so with Men’s Society’s Handsome Dad Beard Kit by my side. For a newly bearded man, it can be a little bit daunting to be faced with the enormous arsenal of beard products. It feels quite similar to baby paraphernalia in that you can be made to feel irresponsible for not buying all of it, only for half of it to sit unused in a drawer somewhere. 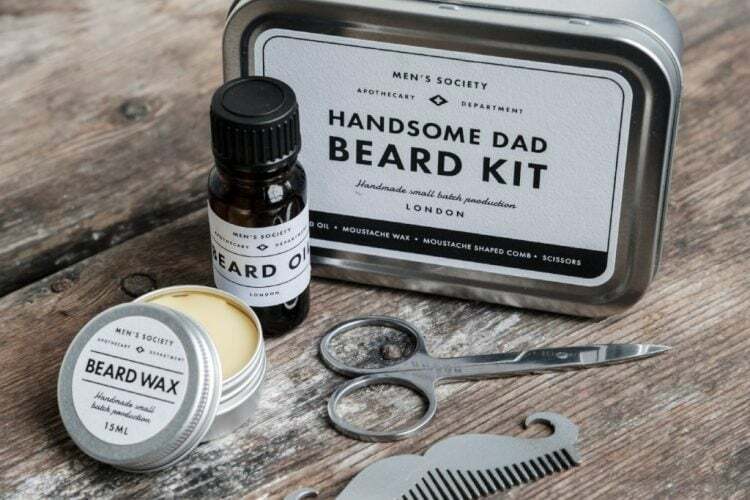 Men’s Society have done an excellent job here of providing a great kit at an excellent price, ensuring that you can effectively care for your beard using only what’s contained within. The beard oil is the essential ingredient in any beard care kit. Every beard needs it for conditioning and I’ve found it invaluable for keeping the skin underneath ticking over. Men’s Society’s oil (a 10ml bottle in this kit) is a very fine-smelling amalgamation of grape vine, avocado, orange and ginger, a fresher combination than a lot of other beard oils. My longish beard swallowed up three drops like it had been dying of thirst and the scent lingered nicely, without being overpowering. The only minor quibble is the dispenser requires a little bit of patience to get the oil out. Hold it upside down and wait; shaking it doesn’t help. But, the upside to this is that eye-dropper bottles of other oils have exploded and dispensed beard oil all over my washbag on three separate occasions, so no fear of that here. The comb is a metal one shaped like a dandyish handlebar moustache. There are some who are very much anti metal combs, and while they might not distribute the oil through the follicles as effectively as a porous wood one, this handmade comb glides through the hair without snagging. The addition of a small scissors for trimming stray hairs is a nice touch, especially if you plan on bringing the kit away with you. Beard wax isn’t something I’d given much thought to – unless you count an ill-advised dalliance with moustache shaping. However, this little 15ml tub of beard wax has proved something of an eye opener, especially with my bushier beard. It’s incredibly effective at smoothing the follicles and keeping everything neat and tidy. It’s a simple little mix of beeswax, coconut oil and vitamin E, so nothing that will aggravate the skin. Everything comes in a nicely designed tin – along with a card that provides instructions for the newly bearded – small enough to be easily accommodated in a weekend bag. All in all, it’s a super little kit that provides top notch beard care with minimum fuss. I still can’t carve a pipe though.